The Doggerel Party of Canada: How Many Signs Do You Need? The Ottawa Citizen carries an editorial today describing the story of one Ross Taylor, an Ottawa man who recently became stuck in a muddy bog up to his waist and had to be rescued by emergency services. Mr. Taylor decided to take a short cut from a bus stop on Terry Fox Drive, in Ottawa's far west end, to Scotiabank Place, home of the Ottawa Senators. The short cut took him across undeveloped land between a Home Depot and the hockey arena's parking lot. Halfway there, Mr. Taylor encountered the Carp River, and in particular, the mud of its banks, whereupon his stroll came to an abrupt and sinking end. The Ottawa Citizen seems to feel that there should have been a fence or a sign to warn Mr. Taylor of the impending arrival of a muddy bog in his path. Indeed, the editorial describes the absence of such indications as an 'embarrassment' to Ottawa. 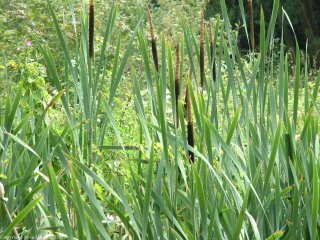 It's a bullrush... in fact the area in question is covered in bullrushes. Absolutely covered. So here we have someone who walks headlong into a field of bullrushes and is apparently surprised to discover a little moisture in the terrain. For my money, there's not much clearer sign of a bog, pond, swamp, stream, river, or other watery obstacle than a field full of bullrushes. I am not convinced that any amount of signage would help Mr. Taylor. It's hard to see how it's the city that should be embarrassed.